I recently received confirmation that I have been selected as a speaker for WordCamp Atlanta 2013 (Fri & Sat, March 15-16). My topic is “Secure All The Things!”. This will be based on the security presentation I gave to the Atlanta WordPress Users Group a few months ago. The new version will probably be a little shorter, and I’ll focus a little more on WordPress-specific concerns (where needed). I’ve been so busy with my new job that I haven’t had a chance to mention before now that I will be speaking at WordCamp Birmingham this weekend. My topic is “CSI: WordPress — Getting Into the Guts“. I’ll try to give intermediate WordPress developers a peek into some of the major API hooks to be aware of, some more obscure but useful ones, how to make your own plugins extensible, etc. 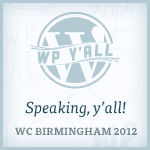 WordCamp Birmingham takes place this weekend, January 14 & 15, 2012, and last I heard there are still a few tickets available. If you’ve been waffling over whether or not to go, just do it! WordCamps are very friendly and social, and the cost for this 2-day event is only $35, which is amazingly cheap compared to your typical technical conference (which can run from the $hundreds or even over $1,000). You’ll be able to meet with and pick the brains of some of the brightest minds in the WordPress community (and me, too). Will I see you there? It’s time to do some cleaning up around here. Some time back, the portfolio function of the theme I was using stopped working (probably due to an updated version of jQuery in WordPress core, and the theme not following best practices). Since I had switched from consulting to a full-time job, I didn’t worry too much about it, but was still in the back of my mind, bugging me. But now I’m going to try getting the site back in shape, just on general principle. I’ve purchased the Genesis Framework, and I’ve got Portfolio Slideshow Pro running on the front page. I don’t have the sites and individual project pages linked up yet, but at least there’s no longer a big, useless, empty space staring at you. Everything is still pretty bare-bones at the moment. I need to fix up the portfolio as mentioned above, and I need to start building a child theme and customizing the styling. Then, hopefully, I can start posting some actual content again — at least occasionally. 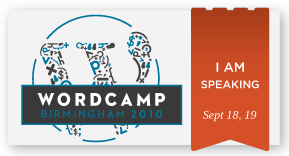 I will be speaking at WordCamp Birmingham, which is September 18-19, 2010. My topic is “The Downside of a Popular Project”. This will be an expanded version of a blog post I made a few months ago: Open Source Community Personality Spectrum. But in addition to just talking about different personality types in a community, I’ll talk about more specific things, like scaling your community, security threats, and dealing with “trolls”. While I will speak a bit specifically about WordPress, the subject matter pretty much applies to any online project or community, and some of the problems don’t just apply to large or very popular projects. If you are involved in any online community, whether as a leader or just an onlooker, you might be interested in getting a heads-up about what kinds of problems you might face one day. The last few weeks have been just a bit insane, with our kids starting school, and immediately getting sick from the new germ pool. 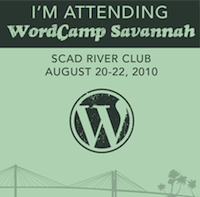 So I forgot to mention that I’m attending WordCamp Savannah. Like, right now, as I type this. Matt Mullenweg kicked things off with an introduction to WordPress, WordCamps, a little history, and mentions of some cool sites that use WordPress in interesting ways. They’re having problems with the projector upstairs, so he didn’t get to show them to us, but he still managed to give a good idea of what kinds of things are possible. Nothing new for me, but there are a lot of people here who are fairly new to WordPress who probably got some good inspiration. Most of my time here will be spent in developer-oriented talks, but currently, I’m sitting in on Lisa Sabin-Wilson‘s WordPress for Dummies Q&A session. We have a copy of the 1st edition, which we passed down to our older daughter, but I want to get a copy of her BuddyPress for Dummies, too. I find that it can be enlightening to hear the questions that beginners ask. As a developer, I often tend to focus on advanced, esoteric corners of the system. But, hearing the questions asked by beginners often inspires me with ideas for plugins or patches to improve features that I might not have looked at as closely. For me, this is the biggest appeal of coming to a WordCamp (even as a plain old attendee instead of a speaker, like I’ve been at other WordCamps) — meeting users and other developers, and getting fresh insight into new things to work on, or new approaches to old problems. Networking for the win!